Sharing a bedroom can be tough. There are territorial squabbles, privacy quarrels, and endless issues over possession of toys, clothes, and space. As a youngster, you inevitably want to take ownership over a room that is uniquely yours. You desire a space to call your own, and this is most commonly the bedroom. Rationing domestic space with a sibling can be a difficult hurdle to overcome, as well as a challenging learning experience. However, through the hardship and trying times, there exists an abundance of possibilities and benefits. Ultimately, sharing a room can be a fantastic bonding experience. Not only that, but children can create a fun environment working with each other, learning valuable life lessons that revolve around teamwork, compromise, and collaboration. But how does one decorate and design a shared space? Planning such a room often stumps many parents, and leads to ineffective bedrooms that don’t maximise their floorplan. Within a well-designed space, children will learn to divide the room evenly, as well as keeping the area organised and tidy. They will communicate effectively, play together, and enjoy the company of having another person around. These days there are numerous options for furniture and accessories. Bunk beds, loft beds, and dual working spaces are very common, which will make your job a little easier. You should aim to create a cohesive theme, and involve your children as much as possible. If you need some assistance, and a few extra tips and tricks, check out the images below, and design a shared room with confidence and style. First off, if your children are going to be sharing a bedroom, you need to make it exciting and inviting. The easiest and best way to do this is with some wall art and interesting decorative items. When deciding on wall art it is a good idea to pick something that appeals to both children. Avoid choosing gender-specific designs, as tastes can change drastically as your children grow, meaning you will be redesigning and decorating constantly! This example above is a great illustration of how to include a stylish design, while coordinating with other colourful and intriguing elements. The bed linen matches the feature wall, and the furniture adds bright and lively hues. Wall stickers are another option that provides a temporary design, which can be changed when your children grow tired of the existing style. When children share a space it is inevitable there will be some opposing interests. Ensuring their play space is multi-functional and caters to their individuals tastes is the first step to domestic harmony. 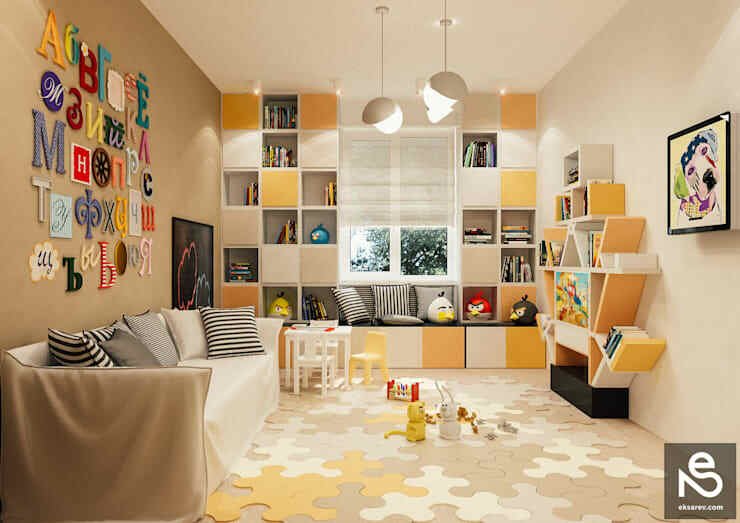 Essentially you will want to create a playroom that has more than one activity. The example above wonderfully illustrates how this can be achieved, with sophistication as well as an eclectic range of pursuits. 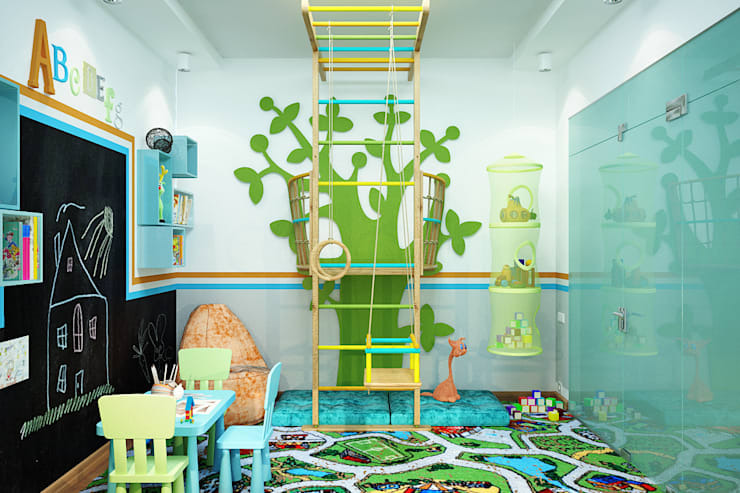 Perfect for apartment living, this relatively small room embraces every centimetre of space, and is a lively and captivating play area. There is a jungle gym, desk, chalkboard wall, and storage for plenty of loose toys. The colour scheme is bright, working beautifully for both boys and girls. No matter the age of your children, it is important to ensure they have a small workspace of their own. This can be an ideal area for homework, reading, drawing, or simply spending a little time on their own. If they share a space, it can be difficult to regulate the cleaning, and ownership over certain items. Additionally, if both children are slightly older, they will undoubtedly have school work that they will need to finish in a quiet and peaceful space. 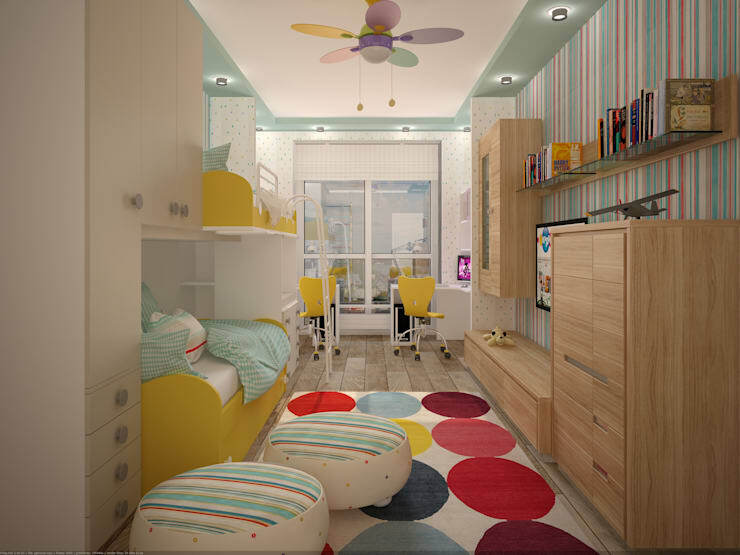 Above is the ultimate shared children's room! It boasts everything from bespoke bedroom joinery, to plenty of individual storage. However, one of the best elements, is the matching twin desks at the end of the room. These workspaces have enough room for each child, and function beautifully to provide a sense of individual space, without crowding the ambience or atmosphere of the room. Wall colour can drastically alter the vibe and ambience of an area. When dealing with a shared bedroom it is important to consider the individuals that will be spending the most time within a space. If one child loves the colour yellow, but the other is not so sure, it's probably best to look for an alternative. Let's face it, there is nothing worse than spending time in a room that isn't suited to your taste or is potentially a colour you dislike. Working with multiple preferences can be a daunting and often relentless process. Sometimes it can be best to chat to a professional interior designer who will offer advice as to how you can include elements of each child's choice or inclination. These days there are numerous options when it comes to beds. From the typical bunk bed, to bespoke joinery that incorporates a range of different configurations, the design will most likely come down the amount of space you have in your dwelling. If you have an abundance of space, then two freestanding beds is often the best way to go, it allows the children to easily get in and out, while you reduce the possibility for arguments over 'who will sleep on the top bunk'. If you are space-poor, then alternatives such as twin beds and bunks will suffice. Nowadays there are myriad options for stylish bunk or loft beds. Gone are the days of rickety ladders, and wobbly frames, bunks are now a convenient and often favourable way to increase sleeping space within the home. In the image above we see a large bed structure that houses four individual sleeping spaces. This type of set up is ideal for those larger areas, and can be perfect for children when they have friends come to stay. The best advice when looking for new shared bedroom furniture is to shop around. You will find so many different options, and there is sure to be something that suits your home and your space. Finally, storage is another important element when designing a shared bedroom. There should be enough space for easy access to individual toys as well as shared areas for children to keep items they both use. When it comes to clothes, the best idea is to have a separate cupboard for each child. This is one area where sharing can lead to arguments over possession of clothing. Keep it separate and you will help each child to feel ownership over their own property. Did you like this Ideabook? 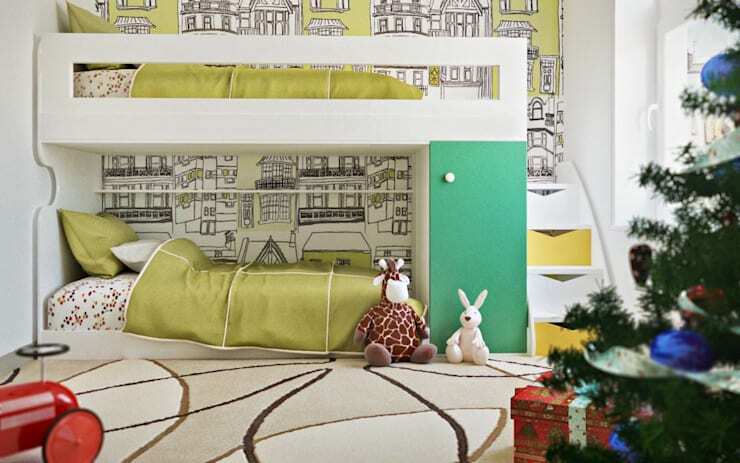 If you did and would like to read another, check out Sophisticated and stylish children’s bedrooms. Do you have experience sharing a bedroom? We'd love to hear your stories, tips, and tricks in the comments section below!